This is a sponsored post written by me on behalf of Soy Vay. All opinions are 100% mine. These Simple Sesame Noodles and Easy Homemade Steamed Veggie Dumplings are indeed super simple to put together. My favorite part? This delicious meal only requires a very simple list of ingredients, with the help of Soy Vay. Because so many of the delicious ingredients are already in the sauce! Hi friends, how have you been? When my husband and I were younger, before we had children, we would go out to eat almost every Friday. After enjoying a great meal at our favorite Japanese restaurant, we'd head across the street to catch a movie. It was simple enough. Looking back though, I cherish all of that time that we had together, just the two of us. Now with four beautiful kids in tow, we don't get out on our own nearly as frequently. So, we tend to grab a few moments of quality time on the weekend, over a special meal at home. My husband's absolute favorites are Sesame Noodles, and Steamed Veggie Dumplings. When I make him this simple and delicious meal, it definitely stirs up some nostalgia - of our Friday night tradition from all those years ago. I just love that we made it to this point, where we can say "all those years ago." 17 years and counting. Friends, I feel so very blessed. 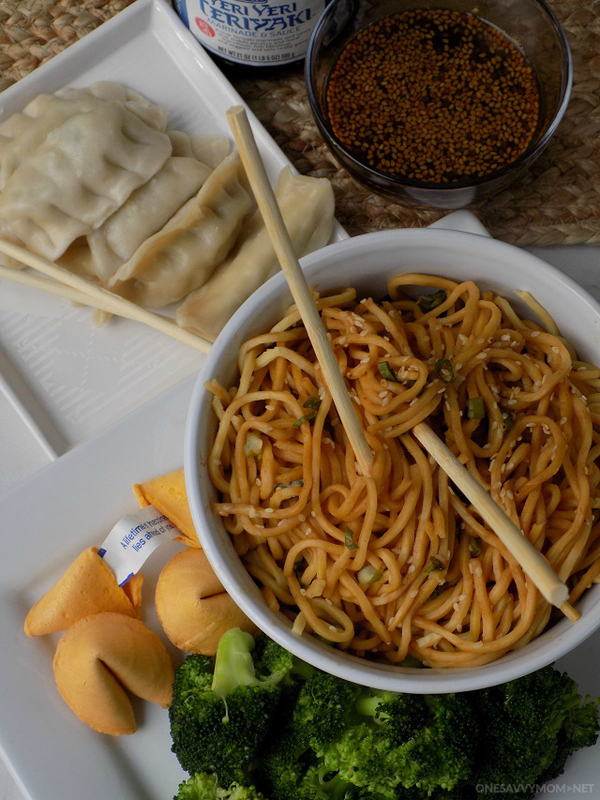 Grab my recipe for Simple Sesame Noodles and Easy Homemade Steamed Veggie Dumplings, below. Optional: Broccoli (steamed) served on the side. In a large mixing bowl, combine Soy Vay Veri Veri Teriaki, minced, sesame oil, and honey in a mixing bowl. Mix/stir until ingredients are combined well. Taste. Make any desired adjustments according to your tastes. Set sauce to the side. Prepare 12 oz. package of Japanese rice noodles according to package. Drain well. Pour sauce over warm noodles. Toss noodles in the sauce for 1-2 minutes until noodles are coated well. Sprinkle in sliced green onions, toss noddles until green onions are evenly disbursed (note: if you prefer your green onions cooked liked we do, you can saute them for a minute or two with a drizzle of sesame oil). Serve alongside steamed broccoli. Enjoy! In a large mixing bowl, stir together coleslaw mix, chopped bean sprouts, sliced scallions, Soy Vay Veri Veri Teriyaki, sesame oil, and ginger. Heat your skillet over medium heat. Once hot, add the mixture from the bowl. Cover and cook for two minutes. Remove lid, and cook for an additional 2-3 minutes (or until most of the liquid has evaporated). Remove from heat. Work with one won ton wrapper at a time. Spoon about 1 teaspoon of the mixture into the center of the won ton wrapper. Moisten the edge of the wrapper with water (use your fingers to spread it). Now fold the wrapper over and press/seal it with your fingers. Crimp the edges with your fingers or by pressing lightly ever 1/2 inch with the backside of a butter knife. Place on a parchment paper lined plate. Repeat this step until all of your dumplings are filled/sealed. For this step, if you have a pot with steamer insert, fill the pot with about 1 inch of water. Once the water has started to boil, spray the steamer insert with cooking spray, and gently add the dumplings ( in a single layer / without the dumplings touching on the sides). Steam for 5-7 minutes, until the dumplings are cooked through. If you don't have a pot with a steamer insert, simply add about 1/4 cup of water to the bottom of a skillet (note: water should be no more that 1/4" deep or dumplings will get soggy). Allow the water to come to a boil. Add your dumplings (in a single layer / without the dumplings touching on the sides). Cover with lid. Allow to cook for 5 minutes. Remove lid, and allow to cook for an additional 2 minutes until the dumplings are cooked through. 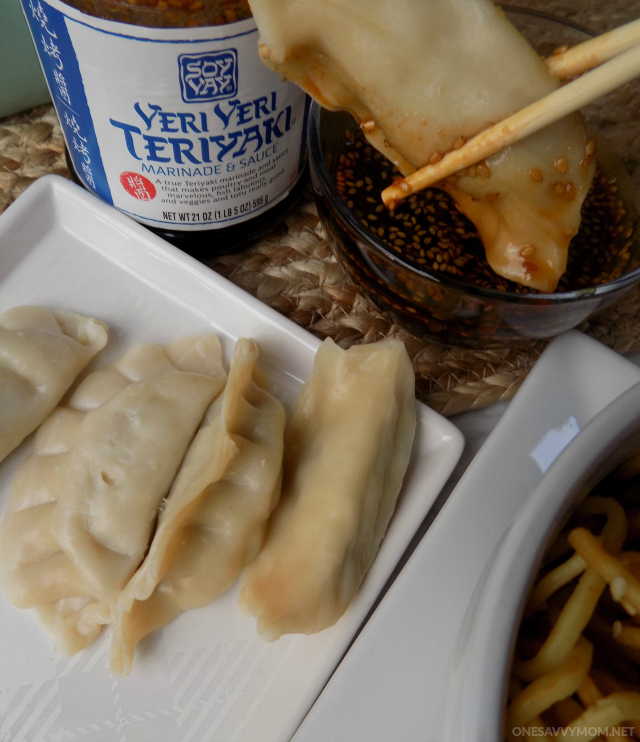 Serve with 1/4 cup of Soy Vay Veri Veri Teryaki on the side for dipping. Enjoy! Soy Vay marinades and sauces have been a go-to in my kitchen for years. I love that I don't have to track down a long list of ingredients, to make a great tasting meal - because so many of the ingredients are already in the sauce! I also love that I can trust the ingredients that Soy Vay uses in their sauces; they only select the very best ingredients (their sauces are also Kosher). in short (check out the whole story below), they do the worrying, so I don't have to! Soy Vay Veri Veri Teriyaki is available at Target in the oriental grocery aisle. Save 20% with the Target Cartwheel app ! That does sound easy and delicious.